Cardstock, stamp, ribbon, ink, punches: Stampin' Up! Hop on over to Twisted Sketches to check out the new card sketch (there is also a new layout sketch every week, too) and play along with us. I look forward to seeing your interpretation. 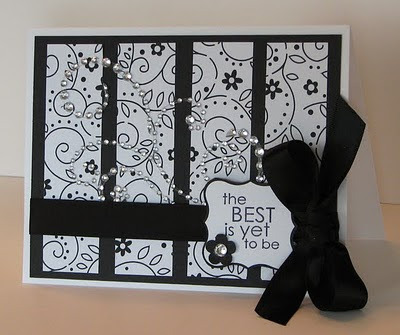 Love this card....so simple and very elegant! so pretty! love black and white together! Wonderful card! Love the sparkles! you did a really gorgeous job on this latest twisted card sketch! I'm glad that I stopped over at your blog because I didn't really see the bling until I saw this photo! just stunning and so elegant! That's beautiful! Love the touch of bling.